INTRODUCTION: The majority of early gallbladder cancers are diagnosed at the final pathology after laparoscopic cholecystectomy. However, when the preoperative diagnosis of gallbladder cancer is acquired from the imaging modalities, laparoscopic approach is controversial. 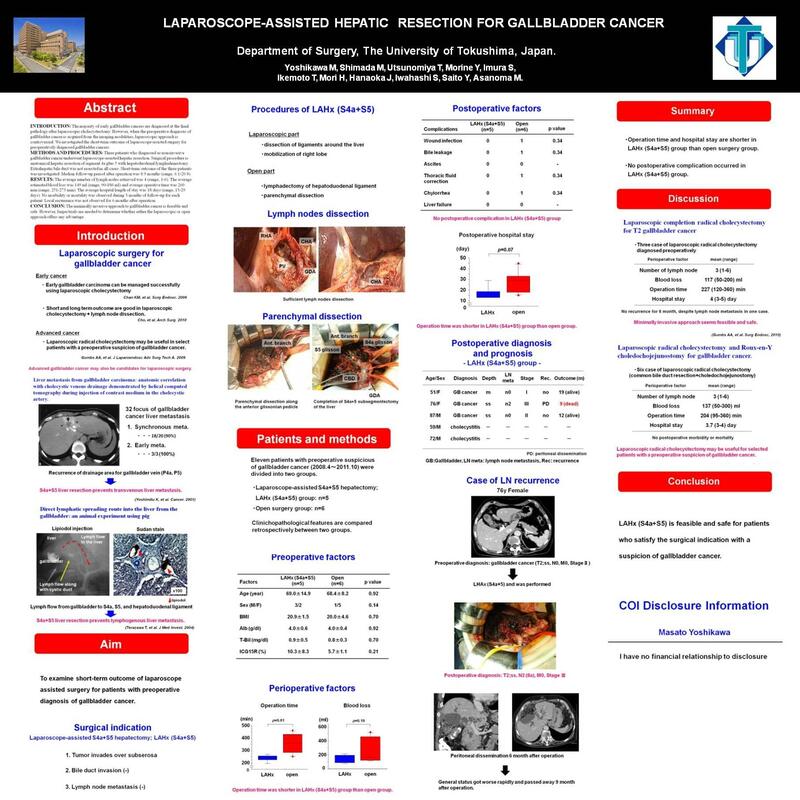 We investigated the short-term outcome of laparoscope-assisted surgery for preoperatively diagnosed gallbladder cancers. METHODS AND PROCEDURES: Three patients who diagnosed as non-invasive gallbladder cancer underwent laparoscope-assisted hepatic resection. Surgical procedure is anatomical hepatic resection of segment 4a plus 5 with hepatoduodenal lymphadenectomy. Extrahepatic bile duct was not resected in all cases. Short-term outcome of the three patients was investigated. Median follow-up period after operation was 8.9 months (range, 6.1-20.8). RESULTS: The average number of lymph nodes retrieved was 4 (range, 1-6). The average estimated blood loss was 149 ml (range, 90-186 ml) and average operative time was 260 min (range, 251-273 min). The average hospital length of stay was 18 days (range, 13-29 days). No morbidity or mortality was observed during 3 months of follow-up for each patient. Local recurrence was not observed for 6 months after operation. CONCLUSION: The minimally invasive approach to gallbladder cancer is feasible and safe. However, larger trials are needed to determine whether either the laparoscopic or open approach offers any advantage.